When you're not sure about your French phrasing, a search engine can be a quick and dirty tool for getting a sense of whether you're on the right track. 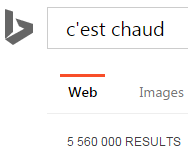 It's not foolproof by any means, but if you search for a short phrase and find fewer than 100 results, it's a pretty good bet that either you've invented a completely new concept or that your French is wrong. On the other hand, if you find hundreds of thousands of results, your phrase is potentially correct - but be careful! There are some caveats. Wow, we've lost tens of millions of results! Let's take a look at what's left. 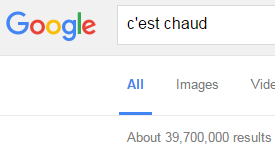 Many of the results are for a webseries or a song named C'est chaud. Most of the rest are explanations of why c'est chaud is wrong (at least for translating "it's hot out"). 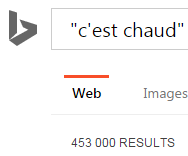 So there you have it: despite huge numbers in Google and Bing, it turns out that C'est chaud does not mean "It's hot" in reference to the weather - it either refers to something like a stove being hot, or it means "It's dangerous, risky." The phrase does exist, but these searches have prevented me from saying something completely different than what I wanted to say. Like grammar checkers, search engines can be useful tools for a preliminary check of your writing, but they cannot take the place of human correctors. If you have a question about a French phrase, try asking one of the French experts on our QandA forum.